I was with a workshop group in the Lofoten Islands in Norway when I took this photograph. It was one of my epiphanic images of 2005, with the mood of the scene suiting the subject perfectly. We’d gone out to photograph sunsets, but the cloud had come in and there wasn’t any golden light. Instead, we were confronted with a mean and moody scene. I love the moodiness of the image with the low cloud in the sky and the mountain looming menacingly in the background. Mood is a really important for me in a landscape image. When I’m shooting wider landscapes, mood is one of the things I look for – in this case the mood is quite sombre. 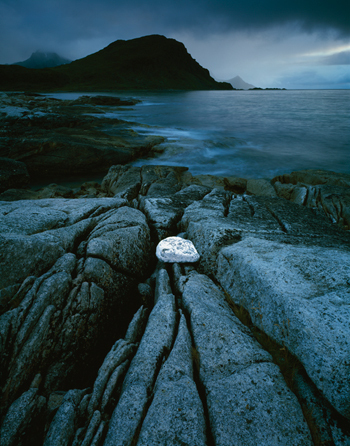 While walking along the shore, I spotted a white stone wedged between the rugged rocks. It is covered in white lichen. I thought the rock had fantastic photographic potential and I tried to encourage some of the workshop participants to photograph it, but they weren’t overly keen. I think it comes down to this notion of having expectations when you embark on a shoot. Because the participants had gone out expecting to photograph sunsets, their expectations were stopping them from seeing other photographic opportunities. Someone asked me later whether I had placed the rock there, but I hadn’t. The bedrock formed a cleft in which the rock was wedged. I went back to this location last year and the stone was still there, but it had cracked in two. Although this is a wide view of the landscape, the image has an abstract, graphic quality. When I photograph wider views I try to make them quite graphic – a lot of my images tend to home in on details within the wider landscape. I like the way the rock is positioned in the centre of the frame. In photography, this is usually a no-no, but I don’t believe in following rules. In my view, a photograph either looks right or it doesn’t. The rock may be small – it forms only a small percentage of the whole frame – but it is a powerful element. It is brighter and lighter than everything else in the frame, and acts as a nexus through which the power in the picture flows. I like the way the energy of the picture runs through the rock and cracks on the other side. It was getting quite dark by the time I took this shot. It must have been about 10.30pm, although there was still enough light in the sky to make the exposure. The fact that the mountain in the background is so dark and there is very little detail here is quite important. I used grad filters to control the sky and in the process this has darkened the mountain. The whole image, although it’s in colour, is very low-key – almost monotone. I think that’s why the image gets away with this level of darkening in the sky behind. I used my Linhof 5×4 camera loaded with Fujichrome Velvia 50 Mark 1 film and a 90mm lens. From memory, my exposure was 8secs at f/32, and I would have metered for the rock in the foreground. I always look at where the highlights are and try to work out what the brightest part of the image needs to be. I used two grad filters: a 1-stop grad over the sea to just above the foreground rock, and a 11⁄2-stop grad over the sky and mountain. At any particular location I usually make just one image, but very occasionally, if the light changes radically, I might make two or three. I keep a record of the exposure information, as I think you have to when shooting on 5×4. I generally shoot three sheets of film. I process one to see how that looks, then process subsequent sheets and maybe adjust the processing. If the light has changed and I’ve had to alter my exposure, I record this so I know how much I need to change the processing of subsequent sheets. I generally shoot on Velvia film because I like its colour palette. The more you use a type of film, the more you understand how it will react in different conditions. The blue of this scene is to do with the fact I’m using a daylight-balanced film in these conditions, and the blue colour cast is a big part of the mood of the picture. Cameras, of course, don’t ‘see’ colour as the human eye does. We accept the colour information from the whole of the environment, even on our peripheral vision, and automatically ‘correct’ the colour of what we see. I’ve trained myself to ‘see’ as my film does. I’m fascinated by how vision works. We take it for granted, but it’s incredibly complex. You have to make a photograph as something within its own terms – and not try to describe the whole scene. Photography for me is about ‘distilling’ what I see in front of me. Other visual arts start from a literal or metaphorical blank canvas, and you add things to this, but photography works the other way – it is about using the chaos and complexity of the world around you, and trying to reduce this to something that fits within the frame. The key is how far you take that reduction.